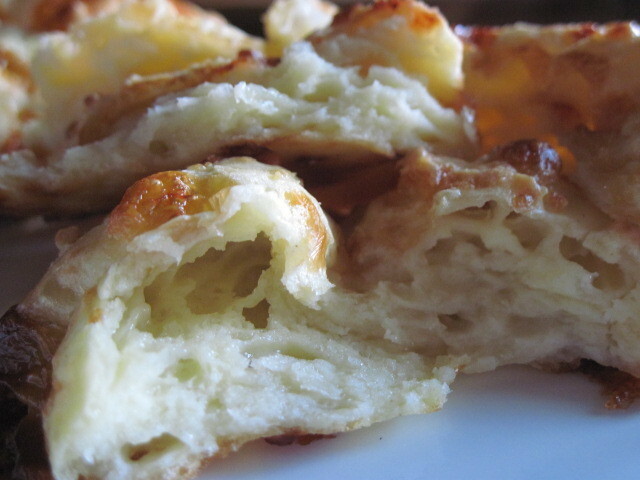 This is the first recipe post for “French Fridays With Dorie” and I couldn’t be more excited. 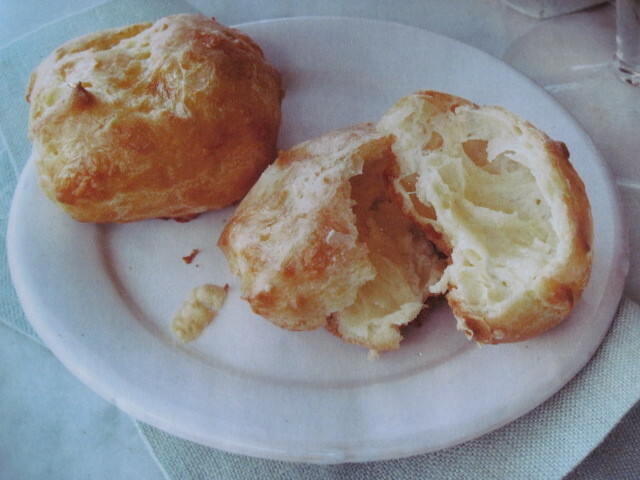 The first few recipes for this baking and cooking group were chosen by Dorie Greenspan herself and her very first choice was the recipe on page 4 for gougéres. 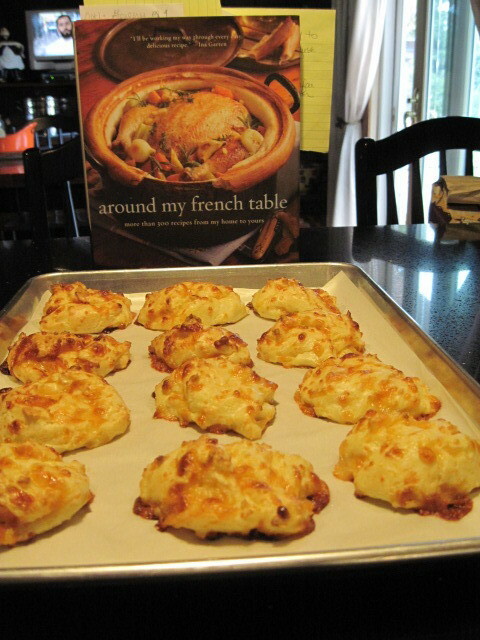 As Dorie states in her new cookbook Around My French Table, “the easiest way to describe gougéres is to call them cheese puffs” and oh boy, these are the cheesiest puffs ever!!! 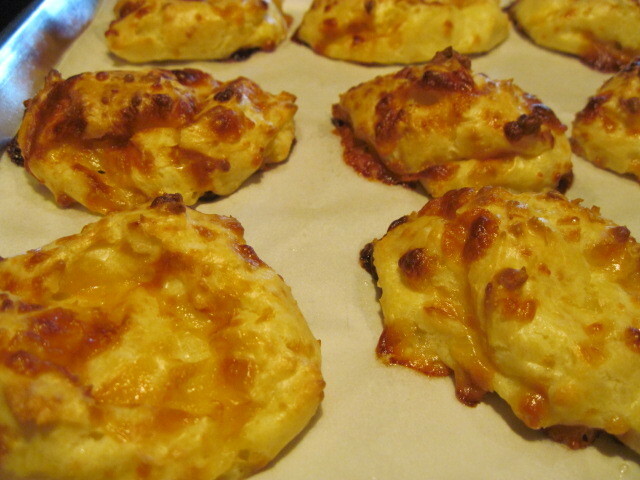 Chocked full of Gruyére cheese, when these puffs are baking in the oven you’ll think you have died and gone to heaven! 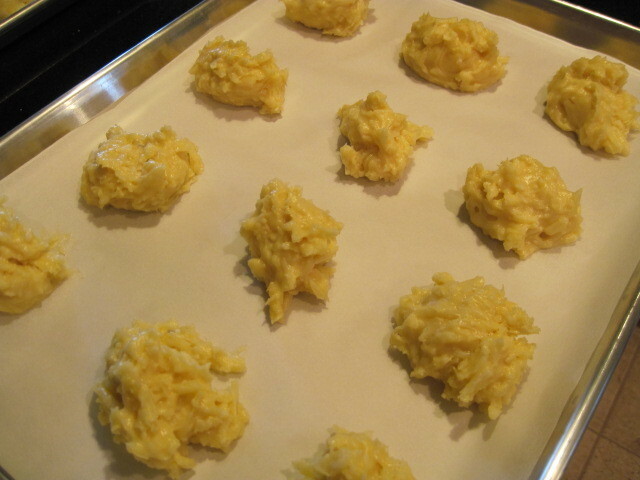 I’ve made “choux” dough a few times in the past (sweet and savory) and have never had an issue with it. This time however, it seemed to lose it’s dense, thick consistency. I have two ideas of what I think I did wrong this time. 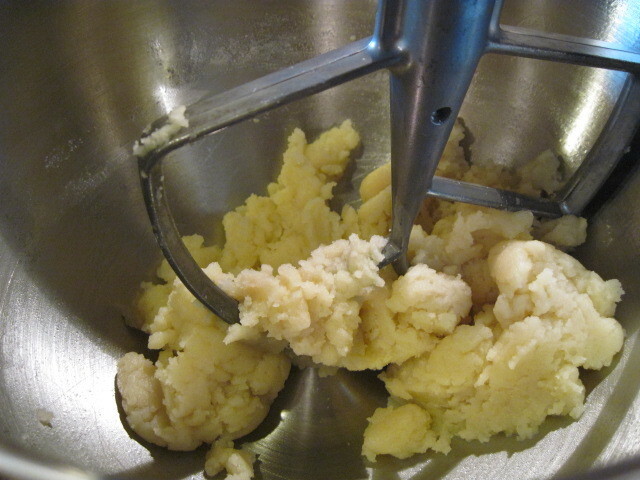 Very possibly I mixed the dough too hard and fast during the egg addition with my stand mixer, which may have broken the dough down a bit. Or perhaps I added a bit too much cheese. Gosh knows I’ve been guilty of that before! The above picture is before the addition of the 5 eggs. 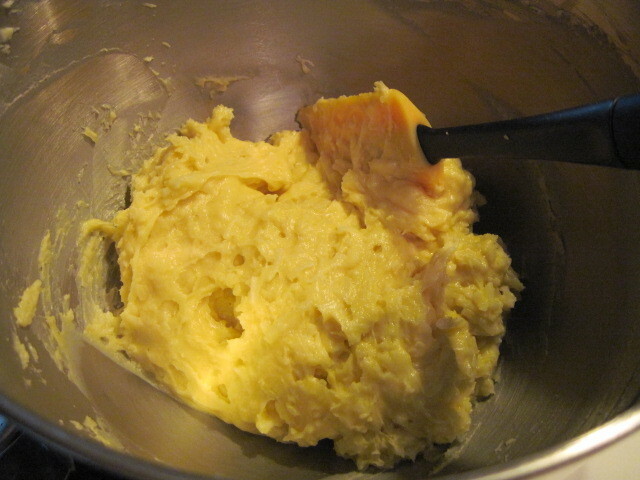 After beating each egg in separately, I think you can see from the following picture that the dough seems just a little too thin in texture. I wasn’t sure how, or if, I should (or could) try and fix the consistency so I carried on and dolloped the dough onto the parchment lined baking sheets. As the recipe calls for, you need to preheat your oven to 425 degrees. But what’s different here is when you slide your ready puffs into the oven, you immediately turn back the heat to 375 and bake them off at that lower temperature for 24-30 minutes, rotating the pans halfway through the baking process. Here are a few photo’s of mine in comparison. I think I’ll give myself two and a half stars on looks and a definite 5 stars on taste, thanks to this recipe!!! With all that said (and shown), the flavor in these gougéres are well worth making again and again. Certainly fancy enough to serve at a lavish dinner party or just plain delicious enough to serve your family in the middle of the week just because you love them! That’s what I did!!! Poor little unpuffed pastry guys!!! 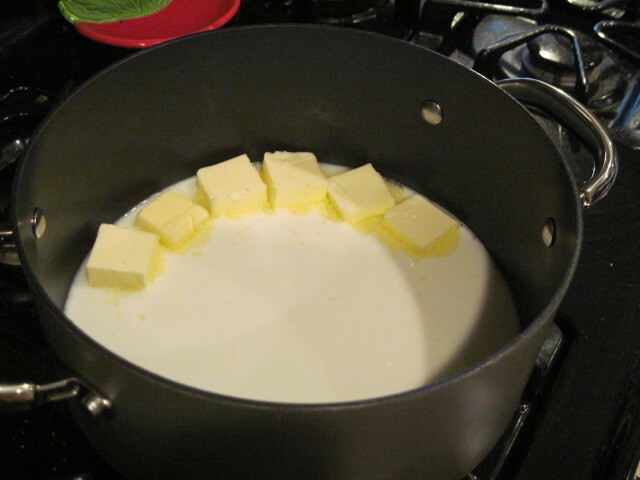 Do you think you maybe should have cooked them a little longer?? In the picture they look a bit moist still. Hmmm…but the most important question is: how did they taste???? Congrats on your first recipe with the FFWD group! I was going to suggest the same thing RJ Flamingo did, about the dough not always needing all the eggs. Regardless of their puffiness, yours look yummy – especially in the second-to-last image! Puffy or not, they look delicious. Sounds as if you really enjoyed your Friday with Dorie. Looking forward to more Friday posts! They look fine to me! And if they taste good, that's what really counts. When I tasted mine, I said, "I think I died and went to Paris!" Those are so lovely. These were easy. And fun. This is going to be a great group. 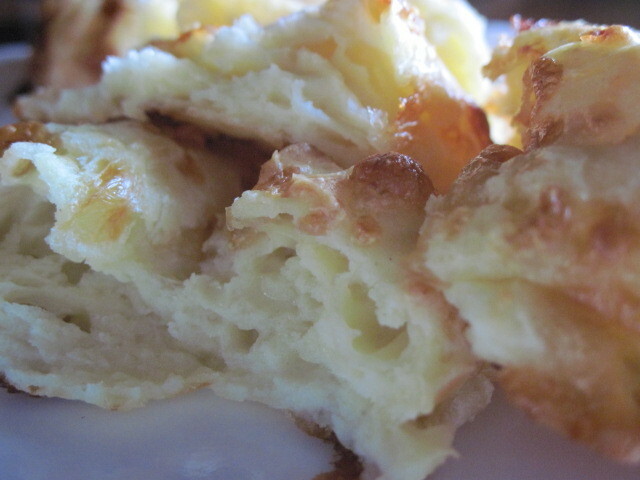 Thanks for stopping by my gougeres post! I don't know why your puffs didn't puff, but if they taste good then no need to worry. Do you weigh your flour? I've found that when I weigh it, my results are way better than when I scoop. (A cup of flour is 4.5 ounces.) Perhaps the ratio of flour to everything else was a bit askew? Looking forward to cooking along with you! Is there such a thing as too much cheese?! I think they look great (and if they were yummy then I call it a success). My suggestion would be they need a little more time in the oven. The first batch I made, I pulled them out a bit early and they were still a bit damp inside (like yours) so I put them back in the oven until they were browned and crusty. One of the batches I made from the freezer I also took out too early but didn't put them back in and they looked like yours inside, plus they flattened out after coming out of the oven. I'm very excited about this group! We're going to make some terrific food. Can't wait! Your dough didn't look wrong to me. Maybe you're right about too much cheese. Anyway, so glad they were yummy. Oooh, we don't care about looks! We want taste, taste! — I think I heard Julia Child say this once on one of her television shows. 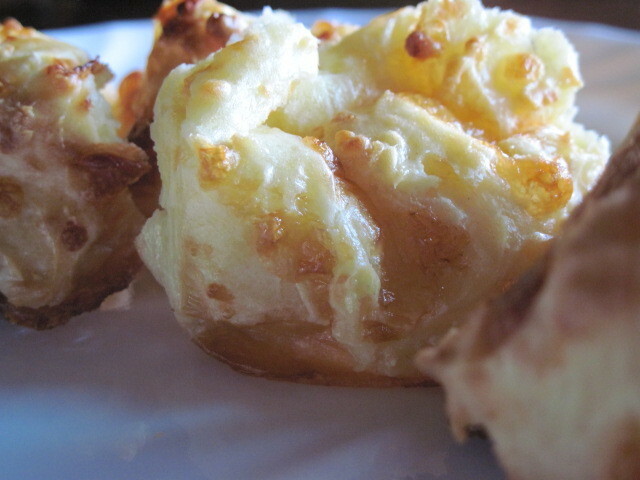 If the gougeres tasted good, who cares if they didn't look quite right!